Finally, after protracted talks between the Islamic regime of Iran and the P5+1, and following the framework accord agreed in Lausanne in April, the parties have signed a deal, which will come into force after ratification by the UN’s Security Council. The Islamic Republic has conceded wide-ranging restrictions on its nuclear programme: the level of uranium enrichment, the number of centrifuges, the reconfiguration of Arak heavy water production facility and signing up to the Additional Protocol to the Nuclear Non-Proliferation Treaty (NPT), allowing more extensive inspections. In return, the West’s economic sanctions against Iran are to be removed over a defined period of time. The arms embargo will remain in force for up to five years, and the ban on import of ballistic missiles for up to eight. Thus, with the Iranian regime’s capitulation to the US and European states, its nuclear efforts, which pursued military objectives, while inflicting severe hardships on the people and subjecting the society to a climate of insecurity, will be limited for at least a number of years. There is no doubt that this deal is not tantamount to an improvement in the relations of the Islamic Republic with the West and its integration in the world economy. The conflict with the West will continue on several fronts. For the regime’s factions, too, the deal will provide another basis for the intensification of their infightings. From the viewpoint of the overwhelming majority of the people of Iran, who wanted an end to the Islamic Republic’s nuclear efforts and the economic sanctions, this deal is a victory for them, and at the same time a huge political defeat for the Islamic Republic, paving the way for an escalation in mass struggles for ‘welfare and dignity’. Factions within the regime and their supporters, including the so-called reformists, claim that this deal will result in an economic opening and a political relaxation, and demagogically try to persuade people to support Rouhani and await his government’s supposed miracles. However, the nuclear deal will not of itself lead to an improvement in the economic condition of the people. The regime will try to push ahead with the austerity programmes and cuts in living standards in the name of ‘economic reconstruction’ and ‘encouraging foreign investment’. So any improvement in the economic condition of the people and any political and cultural opening can only come about as a result of an escalation in strikes and people’s protests. The workers, women and the youth must unify their ranks even more to drive back the regime and enforce their demands on the parasitical rulers. The Worker-communist Party of Iran calls on workers, women, the youth and the masses of the people to turn this development into a stepping-stone in the fight for their demands and the overthrow of the Islamic Republic. Many have described the deadlock in the talks between Greece and the EU, and the call for a referendum, as the start of a countdown. But countdown to what? To a Greek exit from the Euro? To the Syriza government resigning? Or…? The EU leaders and Troika, who insist on implementing the austerity programme, call the referendum effectively a vote on whether Greece stays with or leaves the EU; or at least they say so in order to frighten people from voting no. They know that the majority of the Greeks want to stay in the Eurozone and EU, and so are hoping, through the threat of a Grexit, to sway the result to a yes to austerity. In the meantime, Alexis Tsipras has said that if the result of the referendum turns out to be yes, he will respect people’s decision, but will not be the executor of Troika’s programme. In other words, a yes vote will mean that the Syriza government will step down. Based on such analyses and claims, Greece now apparently stands on the brink of a choice between either leaving the EU or for the government to resign. Supposedly, the countdown is bound to result in one of these options. The truth, however, is something else. Syriza came to power on a platform of no to austerity. The referendum too is about whether to accept or reject Troika’s new austerity package. The Greek government plans to use people’s no vote to reject Troika’s offer and sit round the table from a stronger position. Tsipras has already said this in so many words and asked Greek voters to reject the offer. It’s very likely that the people of Greece will say no to the austerity package, and also very possible that the Syriza government will be able to use this to bolster its position in the talks. However, this will not get rid of the crisis, nor even lessen it. The root of the Greek crisis is not the austerity programme or the inability of the Greek government to repay its debts. These are the symptoms of the problem. The real problem is the economic system which for its survival needs austerity. I.e. the crisis-ridden capitalist system in Greece; the system of the top 1% in Greece and in the rest of the European Union. Over the last decade, Greece, as one of the weakest of the European economies, has become a guinea pig for neo-liberal economic ‘reforms’. The elements of these so-called reforms include: slashing public and social services and health and education; deregulation and giving the market a free hand to set the prices, wages and all the conditions for the sale of labour power; income tax hikes, tax breaks for corporations, etc. The Greek economy, given its lower productivity, lower organic composition of capital and its technological lag, relative to the other EU members, has to drink up this poisoned chalice of ‘reforms’ in order to save capital from its crisis. However, even from the viewpoint of capital’s operability, this solution has so far failed to solve anything. The result has been nothing but financial sleaze and corruption at the top, and growth of poverty, economic insecurity, inflation and 60%+ unemployment for the rest of society. The question is: where does referendum fit in in all this? Which way’s the society heading? Some left critics of Syriza in Greece and outside think that talks with the creditors and the referendum are useless, and say that the solution is revolution against capitalism. 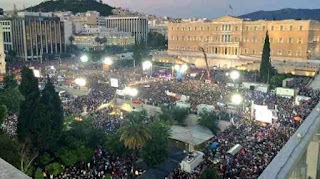 There is no doubt that the solution for Greece – and any other capitalist country – in order to get rid of the problems facing the working people, the society’s 99%, is revolution against capital, or, more precisely, the political and economic expropriation of the capitalist class, the ruling 1%. But revolution does not happen out of the blue. The class struggles have to escalate and deepen and become polarised over capital’s very existence. The ‘no’ to austerity has to grow into a ‘no’ to capital. And this can only be achieved in the process of struggle. Since the rise of Syriza to power six months ago, the class struggles in Greece have polarised over the issue of austerity. The election of Syriza, the tug of war in the talks and now the call for a referendum are all moments in the battle over austerity. In this battle, apparently the Greek government and people stand on one side, and the EU, IMF and ECB on the other. The real conflict, however, is between the camps of labour and capital; between the justified human demands and dreams of the masses, crushed under capitalism’s crisis, and the requisites for capital’s operation and profitability. Thus, as mentioned, the Greek crisis does not have a solution in itself and within the framework of either the rejection or acceptance of austerity. Whatever the outcome of the referendum, the Greek crisis and its economic and social consequences will not end - not even diminish for any lasting period - since the issue of the profitability of Greek capital, and the securing of the preconditions for this profitability, will still be there. Precisely for this reason this struggle can and must end in the deepening and growth of the general social consciousness from a critique of austerity to a critique of capital. The referendum this Sunday, just like the election of Syriza six months ago, is a link in the chain of the deepening struggle between the two camps of labour and capital in Greece. What can and must be achieved politically within the current crisis in Greece is essentially based on the following two axes: firstly, swaying the general social discourse and climate from a critique of austerity to a critique of capitalism, relying on people’s everyday experiences; secondly, organising the masses in council-like organisations for direct intervention in their political destiny (the experience of the Occupy Movement could be instructive here). The overwhelming majority, ‘the 99%’, should come to the realisation that, firstly, standing against them are not just the European states and Troika. The fundamental problem is the capitalist relations and the rule of the capitalist 1% in Greece itself. And, secondly, that expropriation of the capitalist class will take place not from the top, through the corridors of the talks with Troika, but from below, with the direct intervention of workers and the masses in factories and production centres, in districts, neighbourhoods and streets. It is clear that this radicalisation of the society will not happen of itself. Only a radical communist and interventionist party, engaged in society’s everyday struggles, can and must be the agency for driving this agenda forward. This force is not the Syriza government. However, one must hope – and this is completely possible – that such a radical force will emerge and come forth in the process of the tumultuous events that lie ahead. Whatever form and shape this may take, the conditions for the rise of a revolutionary left pole in society are becoming more favourable day by day. The referendum itself could provide the conditions for the development of such a force. Whatever the result of the referendum, Greek capitalism will emerge from this referendum more hopeless and rudderless, and, at the same time, more disgraced and discredited. A Grexit will rapidly open people’s eyes to the fact that the main issue is not merely the austerity programme or Troika but the capitalist system and relations in Greece itself. People will find out that the domestic capitalists are in fact the fourth pillar of Troika. Continuing with the status quo means remaining within the EU and cautiously implementing the austerity programme. But this will also quickly bring people to the conclusion that the problem does not have a gradual and negotiated solution; it must be resolved at the root. So the answer to the question put at the beginning is that yes the countdown has begun, but a countdown to the society’s further turning away from capitalism and ultimately to the settling of accounts with the capitalist 1%.